Sometimes I really hate computers. If anyone has sent me anything in the last week or so it is going to take me a few days to find it again and do anything with it, but I’ll get caught up eventually. Anyway, we are running very late, so I’ll just get on with the gig guide. Come On Gang! Here We Go Magic. Captain’s Rest. Come on Gang! reach Glasgow on their current tour, in support of the release of their new single Fortune Favours The Brave. If you haven’t already done so, go download that, for free, over here. It is ace, and this gig is probably worth braving the abysmal weather for. The Pattern Theory, Luz da Lua. Sneaky Pete’s, Edinburgh. Detour Series 2 Launch. Bar Bloc+. Free. Detour return to their spiritual home of Bloc to launch the second season of their podcasts and gig nights. The line up is a closely guarded secret, but the Detour gang can be counted on to never let you down. 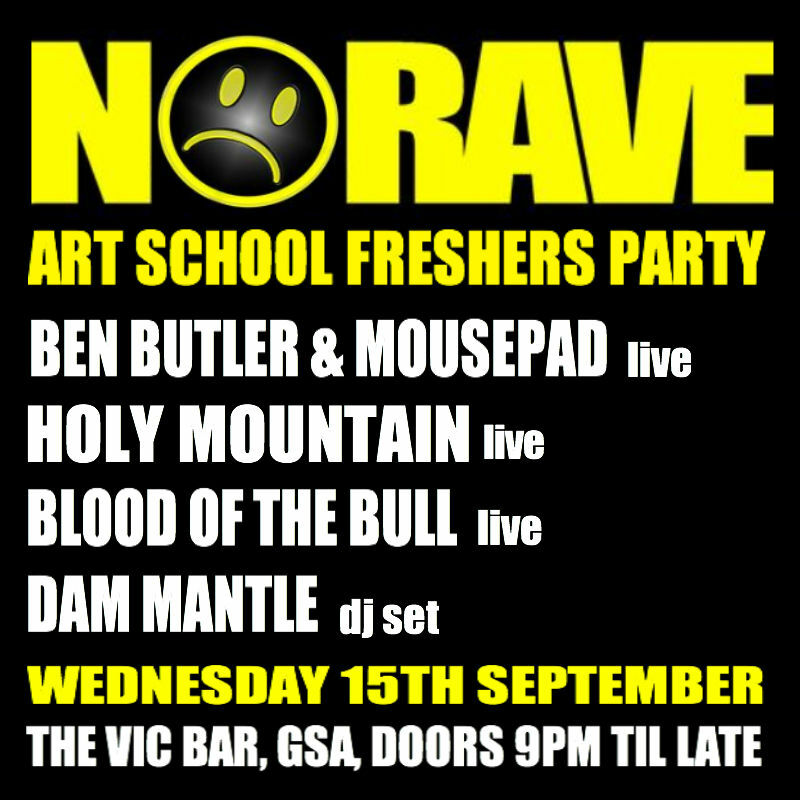 No Rave Art School Freshers Party. The Vic Bar. Featuring Ben Butler & Mousepad, Blood of the Bull and Holy Mountain live, with a Dam Mantle DJ set. Look, a flyer! Some guy in a hat is in town, which may well make getting anywhere a bloody nightmare. If you are in Glasgow then pop along to Waterstones on Sauchiehall St at 6.30 for the launch of Dougie’s War, a new graphic novel by Rodge Glass and Dave Turbitt. Tickets for the launch are free, available from Waterstones. Afterwards you could do worse than swing round the corner to Bloc where you’ll find Galleries and Otherpeople doing a free gig. Also on Thursday, Verse Metrics are playing Pivo Pivo. Oh Friday, once again you have too much on. Aidan Moffat, Aidan Moffat and the Best Ofs, Aidan Moffat and Bill Wells. Paisley Arts Centre. That’s right, it is a rare good Paisley gig. Yes, Aidan Moffat really is supporting himself, supporting himself, as he’ll be playing 3 different sets at the gig – one solo, one with The Best Ofs and one with Bill Wells. Re:Peater Records Launch with Fur Hood, SHe’S HiT and Jacob Yates and The Pearly Gate Lock Pickers. The 13th Note. Good one this one. The first single on Re:Peater Records is due out soon, a splint single with SHe’S HiT & Jacob Yates. Having heard it I highly advise keeping an eye out for it. I’ll talk a bit more about the single in a few days though. Rock Chic is a live fashion and music event aiming to raise funds for the Paul O’Gorman Leukaemia Research Centre at The Beatson, organised by the Poochetes from Pooch, who will also be playing on the night. Also playing live are Miaoux Miaoux, Attic Lights, The Soul Foundation, Figure 5 and a host of DJs. The night promises to be ‘one of the most fast-paced, edgy, glamorous events on the social calender’ with the music going hand in hand with fashion shows, cupcakes and lots more. Trapped Mice, Louise McVey and Cracks in the Concrete, Pete Molinari. Sneaky Pete’s, Edinburgh. Aerials’s Up, Blue Sky Archives, Randolph’s Leap. King Tut’s. Hey Vampires, United Fruit, Cuss Words. Bloc. Free! After a long hiatus Hey Vampires are back on the scene, which makes me a happy man. The Paraffins riverside album launch. Glasgow. No dull, boring album launch for The Paraffins, oh no. The Paraffins and a bunch of guests will be playing an open air gig next to the Clyde, round about where Barfly used to be (and if you don’t know where Barfly used to be you’ve just made me feel very old). Unless it rains, then it;ll be under Central Station bridge. Everything kicks off at 2pm and promises to be done by 6. Should be a great way to spend your Saturday afternoon. Get all the details over on Facebook. The Last Battle, Burnt Island, Matt Norris and the Moon. The Roxy Rooms, Edinburgh. Another album launch, this one for The Last Battle’s debut album Heart of the Land, Soul of the Sea. I’d love to tell you how ace the album is, but it is one of the things I can’t get at at the moment, so I’ve not managed to hear it myself yet. I expect it to be rather good though, and there’s some great supports for the launch. Kid Canaveral, Night Noise Team. Sneaky Pete’s. Edinburgh. We had them in Glasgow last week, now Edinburgh gets their shot. Trapped In Kansas, Penguins Kill Polar Bears, Verse Metrics, I Build Collapsible Mountains. Wee Red Bar, Edinburgh. Looks like Saturday night in Edinburgh is a busy one then? Probably not many better ways to finish off your weekend really.